I’m a homeschooling mom, wife, writer, former pastor, book fanatic, coffee snob, and New England native. I began blogging about politics, society, religion, writing, and whatever else struck my fancy back in 2011. Since that time I’ve migrated this blog from Blogger to WordPress and have created and abandoned four other blogs and a publishing house. In 2017 I published Luther’s Catechism: A Modern Reflection through the publishing house I created then abandoned. From the back cover: “Martin Luther explained the essentials of the faith to his European contemporaries almost five hundred years ago. 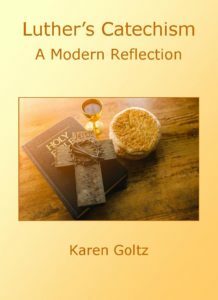 Karen Goltz has brought those explanations into the twenty-first century, with language and examples that illuminate the importance of the Catechism to everyday life.” You can read an excerpt of the book here. Even when her mother died in childbirth leaving her to care for ten younger siblings, Hope never questioned the strict patriarchy of her upbringing. Only after her family disintegrates on the altar of faith is she ready to escape. But how can she be independent when she’s only learned obedience? For our eleventh wedding anniversary, my husband and I went to dinner and a show at the Bull Run Restaurant in Shirley, MA, where folk musician Roy Bookbinder was playing. Neither of us had every heard of him, but Tom likes folk music and I was willing to give it a try. The music itself was good, but what really struck me was Bookbinder’s storytelling. He interwove stories throughout his set, and actually spent more time talking than singing. All of his stories were just things that happened to him, the kinds of things that happen to anyone, and they only became important because he chose to pay attention to them. The events of his life were stories to tell. You can see what I’m talking about here. In the past, I’ve focused my blog on religion and writing. My tagline was “Words Matter,” which applies to both themes. But now I want to tell stories, so a number of my blogs posts will be in story form. Some of them will be in first person. Some will be in third. Most will be true. Some will be pure fiction. All will focus on paying attention and making the unimportant important. I’ll still probably write about writing and religion. Both are a big part of my life, though I’ll write about other things, too. I welcome comments, but, recognizing that religion is a subject that can evoke a passionate response, I do ask that all comments be civil and on-topic. I don’t mind if your comment supports or expresses beliefs or opinions that are different than mine, but any comment I construe as being an ad hominem attack against me or another commenter will be deleted. Thank you for stopping by, and I hope you will subscribe or visit often. 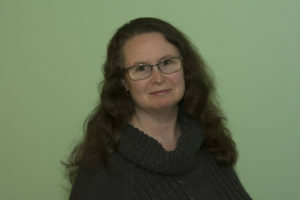 You can also visit my Facebook page (Karen Goltz, Writer) or follow me on Twitter @KarenAGoltz. do you have an article on the toxic church you were pastor of? Beyond a few posts that reference its existence and a little about how it affected me, I haven’t written about it specifically. That makes sense. I enjoy your stuff. I hope you are doing well. I am not sure whether or not you are the one who wrote the wonderful story “New Direction,” from a recently published book for the Chicken Soup for the Soul series. The story, however, touched my heart and soothed my soul in a very positive way. Please let me know if you are the same Karen Goltz who wrote the story. Yes, I wrote the story “New Direction” in Chicken Soup for the Soul’s Miracles Happen edition. I’m so glad you enjoyed it! You may be interested in the daily devotions I write over at http://www.QuietPublications.com. Thanks for stopping by! Just looked you up to say thanks for your faithfulness to God’s call to write. Just read “New Direction,” in Chicken Soup for the Soul: Miracles Hapoen. To say it blessed me would be an understatement!!! Keep writing, keep serving God. Your service is bearing fruit. Thank you so much for looking me up and for the encouragement! I’m glad my contribution to Chicken Soup for the Soul had such a positive affect on you. Blessings! You need to enter your e-mail address in the box on the right hand side of the screen (just above ‘Recent Comments’) then click ‘subscribe’. Thanks for following!